Dacia Logan 1.2 16V, engine oil capacity in quarts / liters. Dacia Logan with engine 1.2 l, it is a cargo cars. Dacia Logan engine code: D4F 732/734. Dacia Logan engine oil capacity liters: 4 l.
Dacia Logan manual gearbox oil capacity. Dacia Logan automatic gearbox oil capacity. Dacia Logan recommended engine oil: A.Z. Meis MT 7 5w-40, Castrol 5w-40 Magnatec, Mobil 1 Super 2000, Mobil 1 Super 3000, Liqyu Moly Toptec 4100 5w-40, Liqyu Moly Toptec 4200 5w-30. Dacia Logan 1.4 l, engine oil capacity in quarts / liters. Dacia Logan with engine 1.4 l, it is a cargo cars. Dacia Logan engine code: K7J 710/714. Dacia Logan engine oil capacity liters: 3.3 l.
Dacia Logan manual gearbox oil capacity: 3.1 l.
Dacia Logan 1.5 dCi, engine oil capacity in quarts / liters. Dacia Logan with engine 1.5 l, it is a cargo cars. Dacia Logan engine code: K9K 790/792, K9K 892, K9K 796, K9K 892. Dacia Logan engine oil capacity liters: 4.5 l.
Dacia Logan engine oil capacity liters: 3.3 l for engine code K9K 796. Dacia Logan manual gearbox oil capacity: 2.8 l.
Dacia Logan recommended engine oil: A.Z. Meist MT-7D 5w-40, Castrol 10w-40 Magnatec Diesel, Castrol 5w-40 Magnatec Diesel, Liqyu Moly Leichtlauf Diesel 10w-40, Diesel, Mobil 1 Super 2000 X1 Diesel 10w-40, Mobil 1 Super 3000 XE Diesel 5w-30. Dacia Logan 1.6 16V, engine oil capacity in quarts / liters. Dacia Logan with engine 1.6 l, it is a cargo cars. Dacia Logan engine code: K7M 800/718, K7M710, K4M 690/696. Dacia Logan engine oil capacity liters: 3.3 l for engine code K7M 800/718, K7M710. Dacia Logan engine oil capacity liters:4.8 l for engine code K4M 690/696. 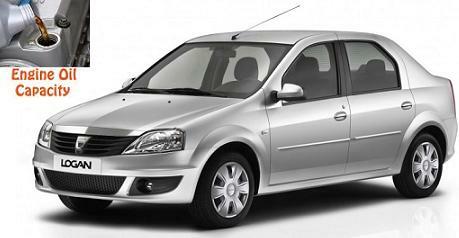 All information about engine oil capacity or gear box oil capacity is taken from Dacia Logan owners manual.